Last summer's Rail, River, Hudson trip was such a good time, we thought we'd try it again. And we'd love for you to come along. What is Rail, River Hudson? 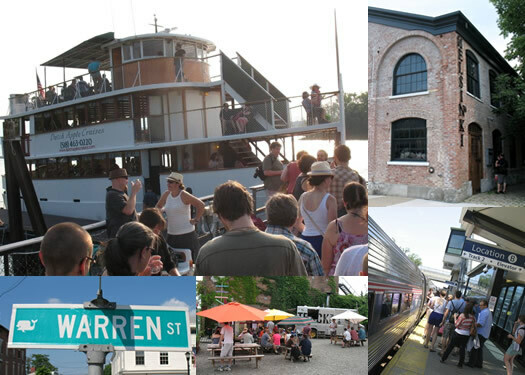 On Saturday, July 11 AOA will lead a group of people to Hudson via Amtrak and back home on a sunset cruise on the Dutch Apple. In between there will be plenty of time to explore this fun and historic city, plus tastings and dinner. There are more details after the jump, but these photos from last year's trip will give you a good sense of what to expect. A day trip to Hudson via AmtrakÂ® with a return sunset boat ride to Albany on The Dutch Apple Cruise Line. Saturday, July 11, 2015. We'll meet at 10:30 am. + We arrive in Hudson, and you'll have time to shop, browse, take in the architecture, and have lunch. + You'll get a Hudson Passport filled with discounts at shops and restaurants throughout downtown Hudson. The passport will be good from July 11 through August 11, so if there's someplace you want to check out later, you'll have a whole month to claim your discounts. + Later in the afternoon we'll gather at Helsinki Hudson for hors d'oeuvres and a tasting of locally-produced drinks. + We'll then head to the Hudson riverfront for a sunset cruise home to Albany on The Dutch Apple, including a light dinner. + We'll arrive back in Albany at the Corning Preserve around 10:30 pm. It's a short walk across the pedestrian bridge to the parking garage. + More swag and surprises TBA. Tickets for this full day of fun, food and travel: $65 per person. They are on sale now via this link. Tickets include the train ride to Hudson, the boat ride back, a light dinner on the boat, the Hudson passport discount card, and the Helsinki event. Past AOA tours have been very popular and last year's Rail, River, Hudson trip sold out, so you may want to grab your tickets soon. + This is a rain or shine event. And tickets cannot be refunded. + Wear your walking shoes. Downtown Hudson is less than a mile from the train station, but you'll be getting there on foot and some of the walk is uphill. We'll also be walking back to the riverfront to catch the boat. + The return cruise is about 3 hours long, depending on the tide. That part of the Hudson River valley is beautiful. + CDTA: The Capital District Transportation Authority. Sniff. I won't be home from the PA farm in time to make the trip. I'm going to keep my fingers crossed that I'll be able to attend the 2016 excursion. Have a great time. The maiden voyage looked outstanding. I bought two tickets but my plans changed. If anyone is interested in purchasing them from me, please email me at ingriduconn@yahoo.com Thank you!!! Another Darn! Previous unchangeable commitment.